By jumping straight into a solution or “prognosis” during a sales appointment, there’s a high likelihood you’ll blow the opportunity and lose the sale. A good salesperson will tell you that the majority of your time during a client meeting should be spent in uncovering your client’s needs and making a “diagnosis” before offering your tailored solution. But how do you know that you’ve gotten to the bottom of their needs and avoid falling into the Assumption Trap? Clients will frequently name their needs on a superficial basis, and many salespeople will immediately rush in to offer a solution. It’s what we do – we solve. Right? If you jump right in when you think you know the problem, you’re wasting an opportunity to learn about other issues (a.k.a. other sales opportunities) and you risk solving something that isn’t the root cause. Then your client will feel you don’t understand them and their business, and you’ll be left to explain why you didn’t make a sale. But how do you avoid this crucial mistake? First of all, don’t accept what the client tells you right off the bat. And for goodness sake, don’t assume you know what they need! Keep digging, and ditch your script. You’re looking for Hard Evidence instead of the problem, and I’ve included some helpful questions below that should be added to your repertoire. 1. Discuss the customer’s internal process. Spend time with the client and make it clear that the questions you are asking pertain to building the business case. Link the evidence you are looking for to their approval process. 2. Discuss your experience with other similar clients or projects. Most clients are keen to hear what their competitors or other companies are up to. Without disclosing confidential information, you can outline what you’ve seen done in the project scoping and vendor selection phases. 3. If you’re desperate, talk about your own need to justify your time on the project and explore other internal resources. If you’ve got serious concerns about their ability to commit or move forward, let them know that in order to get the resources you need to develop a proper solution, you need to show your manager the business case and ROI to determine if you’re the right fit. Do this in a way that doesn’t undermine your expertise though! If you get positive responses — great — carry on! If you don’t, then it’s quite likely the client isn’t ready to move forward anyway, or isn’t serious about the issue at hand yet. This is likely a good time to put the account on a follow up schedule and move on to other opportunities. 1. What symptoms do your clients usually present? 2. Check the quality of the evidence. 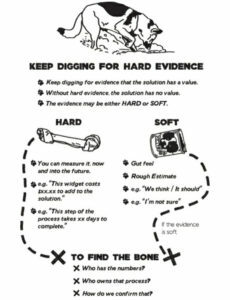 Keep digging until you find the hard evidence. 3. Is there an opportunity for Marketing to address the symptoms to attract more prospects? 4. What assumptions about your industry or solution does the client make? Are there assumptions that need to be corrected? Does this provide an opportunity for differentiation or building trust? 5. What are the key questions that you should be asking the client to ensure that you have a complete list of his or her issues and concerns?